MIKE ROBERTS is an award winning composer, producer, arranger and pianist with an impressive and broad track record of nearly 20 years in the music industry. As a composer he has written music for BBC television, ITV, Tyne Tees TV, Pace Productions, Warner Classic, CNN, Stock Music, Focus Music, North Star Music and Telemagination to name just a few. 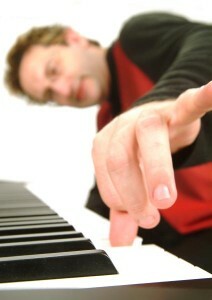 As a pianist and MD he has worked with The London Contemporary Dance Theatre, Bedside Manners Theatre Company, York Lively Arts and won critical acclaim with his unique arrangement and performance of George Gershwin's Rhapsody in Blue. He has produced 4 commercially released albums to date, written tracks for dozens of compilations and specialises in the ability to produce music in any style/genre.